An increasing percentage of green builders are choosing to install heat-pump water heaters — appliances that use an air-source heat pump to extract heat from the air, transferring that heat to water stored in an insulated tank. 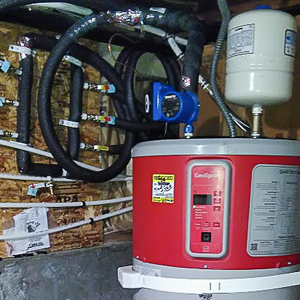 Most heat-pump water heaters incorporate both of these components — the heat pump and the insulated tank — into a single unit, with the heat pump compressor mounted above the insulated tank. This type of water heater is typically installed in a basement, mechanical room, or (in warm climates) in an attached garage. 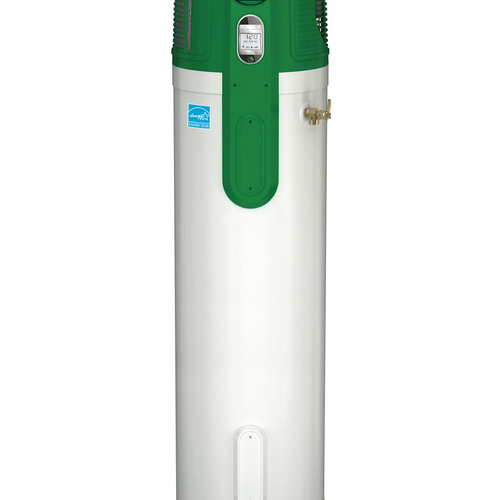 If you look at the heat pump compressor mounted on top of a typical heat-pump water heater, you’ll notice that there are two openings for air flow. The unit has a fan that pulls ambient air through the intake. Inside the unit, this air passes over a copper heat-exchange coil and transfers some of its heat to the refrigerant flowing through the coil. Then the air, now cooled, is expelled from the exhaust side of the appliance. This process raises the temperature of the refrigerant and, eventually, the water in the tank. The process also cools the air in the room where the heat-pump water heater is located. 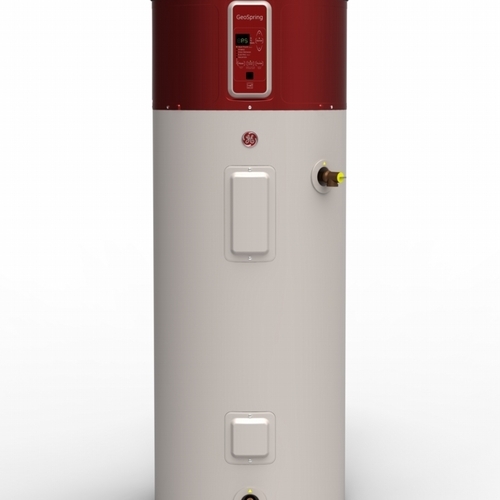 If a heat-pump water heater is installed in a very small room — a closet or a tiny mechanical room, for example — the room can get so cold that the heat pump can’t operate properly. That’s why the manufacturers of heat-pump water heaters dictate the minimum volume (generally, 1,000 cubic feet) of the room in which this type of appliance can be installed. The larger the room, the lower the chance that the room’s air temperature will sink to a level that is too low for efficient operation of the water heater. Thanks for the great info Martin. 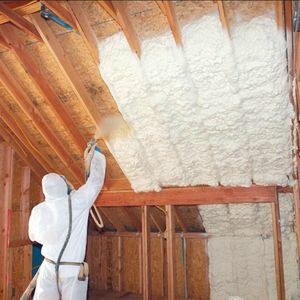 In the Pacific Northwest we've advised builders that if the unit is located inside the heated space, ducting both intake and exhaust to the outside is a good option for 2 reasons - 1) you avoid pressurize/depressurize issues on the building envelope in a tight house and 2) the outside temperature is above 35 F most of the year up here and I believe that's the cutoff point where most of these units switch to electric resistance heat. Even though the heat pump will run less efficiently at colder air intake temperatures isn't that still better than ER mode? 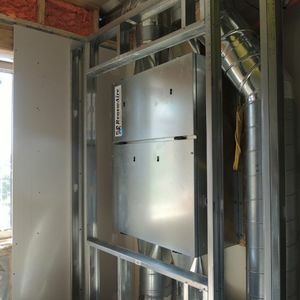 A Habitat project I'm working with will be installing a Rheem and ducting the exhaust into a conditioned crawl. The sole criteria is really comfort, it seems like a win/win to let the cool air temper in the crawlspace before returning to the house and also keep the intake temps a little higher throughout the cycle. This article is reassuring in that the ducting should have a negligible effect on performance. I'd like to second the factory filter not filtering very well. The one on my GE at home doesn't filter well and seems overly restrictive at the same time. Removing it is worth a good 5 db of noise when it's running. I realize this is a bit of topic, but John Semmelhack's comments about upgrading the filter for the HPWH touch on a concern I have about the Habitat home I mentioned above and others like it. That home will have 5 filters in it that need maintenance, 2 mini-split heads, 2 in the ERV, and the HPWH. If many of those are replaceable the cost could add up, and if they're washable the reality is that many homeowners aren't always that good at keeping up with this stuff. 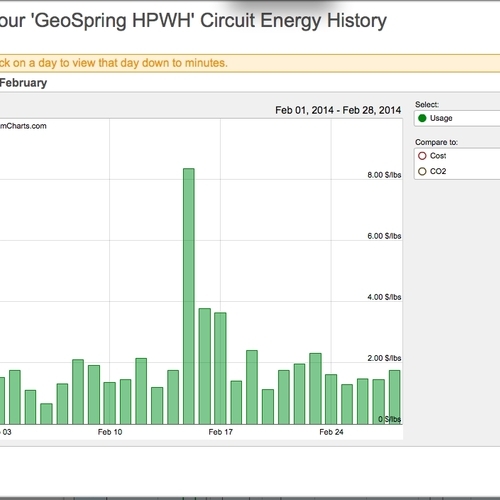 Is anyone out there doing long term maintenance contracts to make sure this stuff is getting done? Reminder systems at least. Ideas along these lines for affordable housing? As someone who does a lot of existing home analysis, maintenance is a serious issue. Dealing with the long term operation of residential high performance homes seems like a good topic unto itself. I'm curious what others are doing. I ducted my new heat pump water heater a couple years ago, with baffles, so in the summer I draw from my hot room and exhaust cooler air into the same room (free air conditioning), and in the winter (climate zone 2, always above freezing), I draw from the outside and vent to the outside. I just installed a Rheem 65 Gallon HPWH in a 500 SF unfinished, unconditioned basement with no other heat source. I'm in Massachusetts so the basement room usually bottoms out around 45 degrees which is where it sits now. During extended operation of the water heater the room will drop to about 43 degrees temporarily. Rheem says this unit can run in heat pump mode down to 37 degrees but I'm noticing the recovery time is very slow, which is expected. 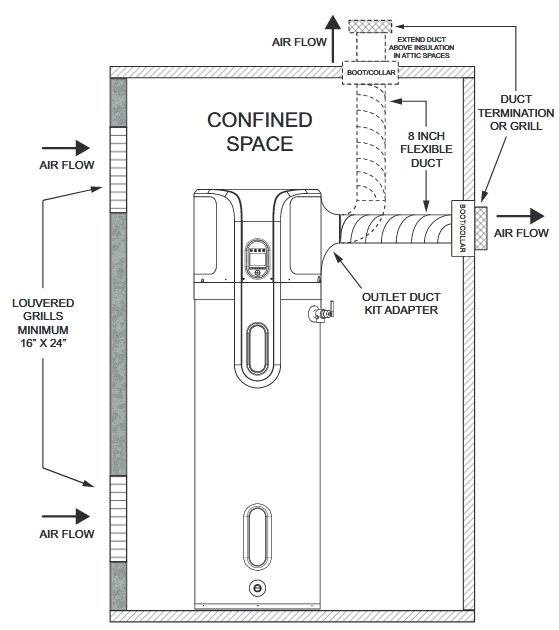 My question is this...does it make sense to duct the intake side of the water heater into the adjoining finished 600 SF basement room in order to steal the warmer air thus increasing efficiency and recovery time? I would plan on leaving the unit exhausting into the unfinished basement which would benefit from the drier air, but I could return the exhaust back into the finished room if needed. It seems to me that this would help with efficiency but would it be significant? Your suggested ducting experiment is certainly worth a try. We are thinking about installing a HPWH in our laundry/mechanical room. The laundry room is 850 cubic feet. The laundry room will also house the HRV system for the house. If we put a supply and return vent from the HRV into that room, will we be able to exchange enough air to negate the cooling effect of the HPWH? The internal ducted multi-position unit for the multi-split will also be in that room. Would another option be to do a significant enough air exchange through that unit to distribute the cooled air throughout the house? I think this latter option would have to be mainly on the supply side to prevent overheating of the room when the HPWH is not running. The multi-position unit will be run in an always-on type set-up in low speed. Your HRV should be set up to provide the desired cfm of supply air as specified by ASHRAE 62.2 or to meet your family's needs. It seems a shame to devote a portion of your HRV's air flow to the mechanical room, where fresh outdoor air isn't usually required. Of course, an exhaust grille (connected to the HRV system) makes sense -- and if you have an undercut on the door, that exhaust grille will help with air movement into the laundry room. If this were my house, I'd probably live with the situation and see how cold the room gets. Of course, there is a downside to installing a heat-pump water heater that is smaller than the minimum recommendations set by the HPWH manufacturer -- you may void the warranty if you don't follow instructions. 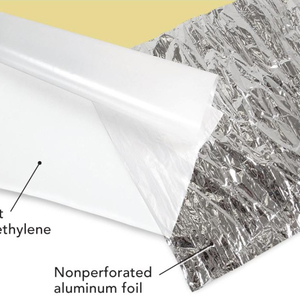 Options include a louvered door on the laundry room (a method approved by some HPWH manufacturers) or ducts connected to the HPWH as advised in the article on this page. Great advice as always. Based on the information in the article and the comments here I decided to go with the Rheem unit in a big part due to noise. It is only 49dB which compares to my current fridge at 44dB (according to the iphone noise meter app). The Rheem calls for a minimum room size of 700 cubic feet (thanks for the link). So I think I should be okay with an HRV exhaust as one might normally do with a laundry room and balanced HVAC connections for normal room conditioning. If I have to duct HPWH I can go out into the hall discharging right above where the main air intake is for the HVAC ducted unit.